Puzder’s withdrawal shows that the resistance movement is building—and beating the odds. On a list of cabinet prospects that Donald Trump filled with unfit pretenders to power, Andrew Puzder was always in contention for the “worst of the worst” title. So it should not come as a total surprise that, on Wednesday, Puzder’s nomination to serve as secretary of labor collapsed in spectacular fashion, at an especially bad time for the Trump administration. But many of Trump’s picks—Education Secretary Betsy DeVos, Treasury Secretary Steven Mnuchin, Attorney General Jeff Sessions—are literally the opposite of what America needs in their positions. What derailed Puzder? Why did his nomination unravel Wednesday? And how should that unraveling be put in perspective at a point when—with the resignation of National Security Adviser Michael Flynn and indications that the Congress might finally begin to take its oversight responsibilities seriously—there is mounting evidence that the wheels are coming off the Trump train. Technically, things fell apart for Puzder early Wednesday, when top Senate Republicans urged the White House to withdraw his nomination because there were, as CNN reported, “four firm Republican no votes [against confirming Puzder] and possibly up to 12.” Even in a chamber that has rushed to rubber-stamp Trump nominees, Puzder could not muster the 50 votes that he needed to avoid defeat by a Senate where Republicans enjoy a 52-48 majority. “After campaigning as a champion of workers, Donald Trump had a chance to name someone to lead the Labor Department who would use the position to advocate for higher wages and increased prosperity for workers across America. Instead, he chose someone who has spent his career perfecting the art of grinding workers into the ground,” explained Oregon Senator Jeff Merkley, a fierce critic of the nomination. Warren, Merkley, New York Congressman Joe Crowley, Wisconsin Congressman Mark Pocan, and other Democrats worked inside the Capitol to prevent Puzder’s confirmation. At the same time, organized labor worked the outside angle. And they never let up. After months of agitating against Puzder, the AFL-CIO stepped up its activism even as Vice President Mike Pence was breaking a 50-50 Senate tie to save DeVos’s nomination for education secretary. Some analysts saw the DeVos confirmation, and that of Sessions, as evidence that Senate majority leader Mitch McConnell could find the votes for even the most indefensible of Trump nominees. 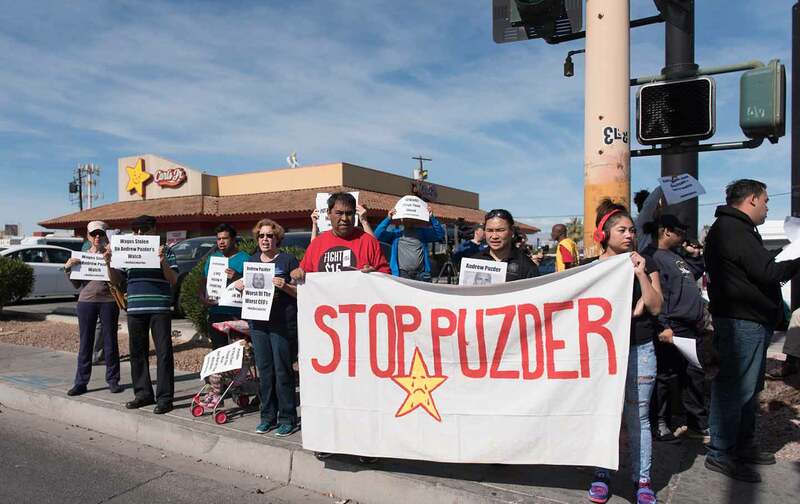 But labor activists and their allies—especially in the farm and food-safety movements—bet that Puzder could be stopped. They attracted support from the broader resistance movement. And they persisted. The International Association of Machinists and Aerospace Workers website summed the fight up this week with two words: “Keep Calling!” Working people kept calling. And it mattered. Puzder really was a horrible nominee, with an anti-worker bias and a sordid past. But bad policies and bad backgrounds were not sufficient to derail Trump picks that McConnell and Republican leaders rushed through the confirmation process in late January and early February. This Trump nominee was stopped because an opposition movement is taking shape, developing inside-outside strategies, and refusing to let Donald Trump and Mitch McConnell call all the shots. Make no mistake: Puzder’s withdrawal is a major victory for the resistance to Trump’s presidency. It shows what that the resistance movement is going from strength to strength. It is building capacity and learning to use that capacity to beat the odds. That does not mean that every fight will end in victory. But it does mean that victories are possible. The way forward is clear. Those who would resist a president who won only 46 percent of the vote—and who lost the popular vote competition by almost 3 million ballots—can and must continue to fight for civil society, the rule of law, and a system of checks and balances that is real enough to trump Trump.